Porceramic Ltd is a tiling contractor based in Essex serving the residential and commercial building sectors with a cost effective solution to wall and floor tiling. 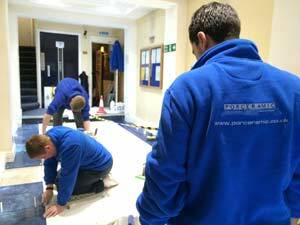 We cater for and carry out all aspects of tiling and substrate preparation, ie - latexing, laying flexible membranes etc. We constantly strive for perfection in anything we do to ensure client satisfaction and elimination of any snagging issues, meaning no downtime due to rectification to you the client. We specialise in all aspects of tiling including natural stone, mosaics, Victorian, porcelain and ceramic. We have extensive experience in both working on site and working in private residential properties. All our staff are extremely trustworthy, clean tidy and punctual ensuring you can feel comfortable in allowing us into your home or business to carry out our work. All our staff hold current and valid CSCS cards and we also have our own health and safety policy in place along with public liability insurance to the value of £5 million. happy to discuss your needs further.